So, we know Allie has a significant speech delay in regards to articulation. Allie talks non-stop but you can only understand about 10% of what she says. There is no doubt she gets frustrated because we don't always understand her. To be honest, big sister Chloe understands her the best out of everyone. There are many times when I'll say, "Chloe, what is your sister trying to tell me?". Allie has been in speech therapy for the past year and a half. We have been addressing this issue the whole time. There is no doubt that Allie is making great progress. 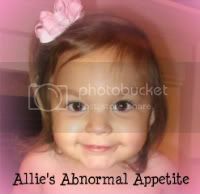 When Allie was a year old, her speech was developing normally, however due to the fact that she was so malnourished at 1 1/2 years old, her brain stopped developing and she stopped talking completely. I remember there were times when Allie would be playing in the living room and I wouldn't hear her make a sound for over an hour. We used to joke that it was easy to forget Allie was in the house because she was so quiet. Once she got her feeding tube and started to receive the proper nutrition, her speech slowly came back. However, when she did start speaking again, she started with babbling like a baby. So, thinking back to where we started with her speech, Allie is making huge progress and I'm very proud of her. Unfortunately, while talking to our current speech therapist this week, she said that typically kids have until the age of 3 1/2 to fix articulation problems. If they don't fix the problems by then, it's possible they will mis-pronounce some words wrong for a very long time. Basically this means we have 6 months to get all of Allie's articulation issues resolved. Don't get me wrong, articulation can be corrected after the age of 3 1/2 but it's much harder to correct. So, our goal is to work real hard and get Allie talking better. As I mentioned in my previous post, Allie qualifies for speech therapy through the school system. She will get one 30 minute session a week. Is this enough? I'm not sure. My other issue is that they don't teach speech therapy during the summer -so are we expected to take those months off or what? There will be no rest in speech therapy for little Allie - if we only have 6 months to get her articulation corrected, we need to work very hard with her. So, I'm currently in the process of contacting several different organizations and trying to figure out what we have to do to get private speech therapy. We plan to utilize the school system therapy until the summer and then hire private for the summer. Once school starts in the fall of 2011, we may go back to the school system or stay with private - depends how everything goes. The kicker is at this point, I don't think our insurance will pay for private speech therapy because it's offered by the school system. I'm still working with our insurance company but it's not looking good. Either way, we will do what is best for Allie and she will get the therapy she needs. In looking for a private speech therapist, I'm also looking for a speech therapist that will work on her oral therapy for eating. It would be nice to have one therapist that works on both issues. We meet with our GI & Allergist the end of April and if neither one has additional testing, I'm really thinking about starting to wean Allie off her feeding tube. I know Allie has to be at a healthy weight, actually she needs to be able to lose about 5 pounds during the wean. So, we have a way's to go with that issue but since being on the blenderized diet, she's gaining great. Slow and steady!!! Allie continues to do great with all of her feedings and I'm loving the fact that I'm feeding her whole food. I won't lie - there are some nights where I wish I didn't have to make her food, however I trudge along and do it. Making her blend everyday doesn't take long - I think cleanup is the worst part. We leave for vacation this afternoon so if you don't hear from me for a couple weeks you know that we are living it up with Mickey Mouse, Minnie and all the Princesses. We are eating lunch at Cinderella's Castle for Chloe's 5th Birthday. The girls are so excited about it. This is our first "big" trip with Allie being on a blenderized diet and also traveling with her food allergies. I won't lie - I'm nervous about it but it will either go good or it will not - and we won't know until we try it. 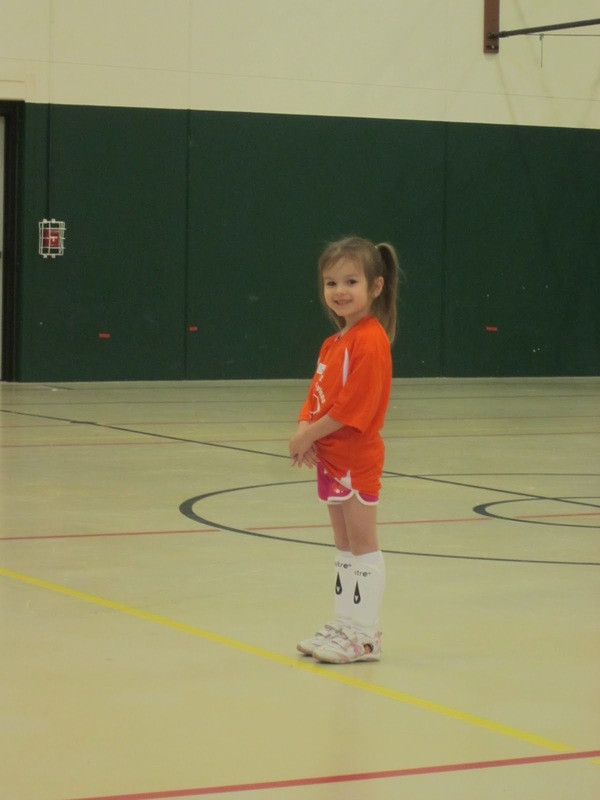 Allie has had a handful of evaluations lately and we got some of the results. 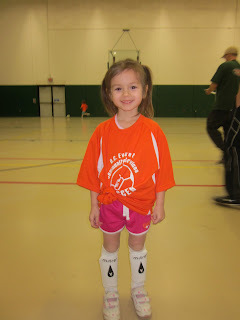 Since she is turning 3 the end of next month, she is exiting the Wisc. birth - 3 program. 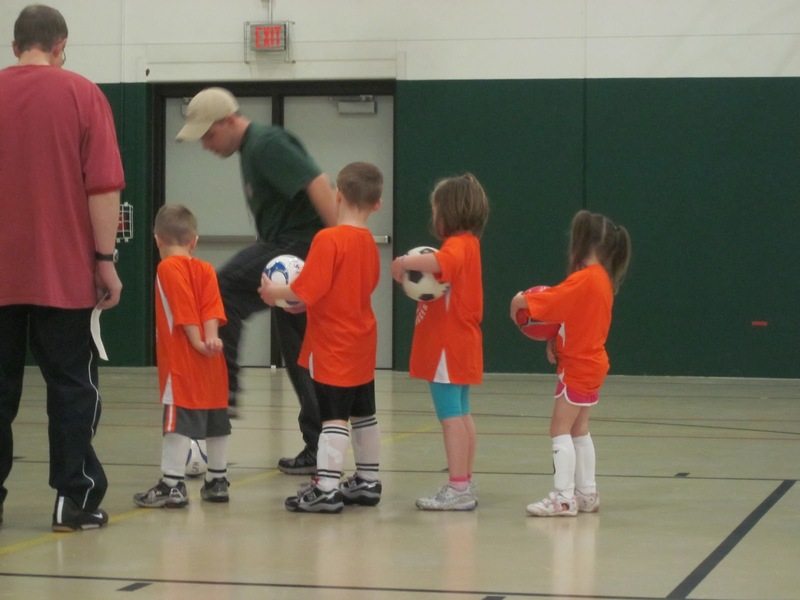 After the birth - 3 program, kids get evaluated for Early Childhood (Special Ed). We didn't think Allie would qualify for early childhood but since it was recommended that she get tested, we agreed. In order to qualify for the early childhood program, a child needs to have 2 significant delays in development. We spent a couple days at a local elementary school so they could evaluate and observe Allie in a classroom setting. Besides being super shy, Allie did great. 3) Articulation skills - 5%. A "significant" delay is 4% so she isn't far from that. So, the only developmental concern for Allie at this point is her speech (articulation). She is basically significantly delayed in that area. 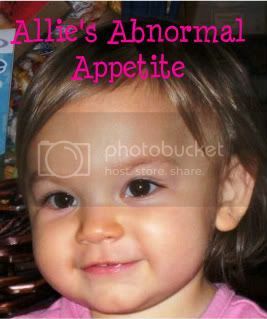 Here is a little bit out of Allie's report, "Allie is able to produce most age appropriate speech sounds in single words; when she co-articulates these with later developing sounds in her connected speech, her overall intelligibility drops significantly to 60-65% with unfamiliar listeners (at three to four years of age a child is usually 80% intelligible to unfamiliar listeners). The number of errors she produced in the evaluation places her well below the normal of her age and this is apparent in her spontaneous speech". In summary, Allie did not qualify for the Wisc. 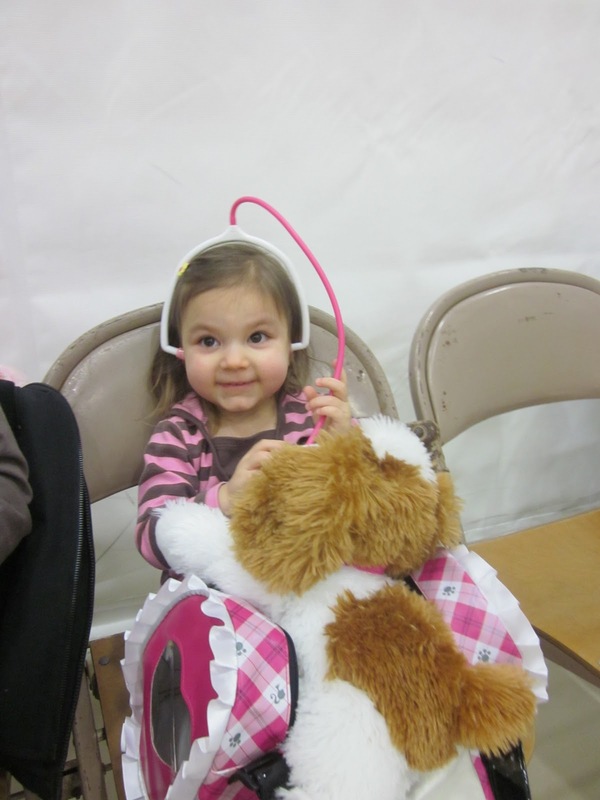 Early Childhood program but she does qualify for speech therapy through the state of Wisconsin. She will get speech therapy at our local elementary school once a week for 30 minutes. Allie did great with all of her evaluations but honestly I'm happy they are over. It's nice to know that she is developing as she should and now I feel like we can move on and continue to deal with her speech issues. As many of you know, we have been giving Allie a blenderized diet for a couple months now. I am proud to say that she is now 100% fed "real food". I make her blends once a day and she receives 5 bolus feeds throughout the day. She is getting roughly 900 calories a day. Once starting on the blenderized feeds, Allie's oral intake dropped to almost zero, however her intake is starting to pick up again. She seems to go in streaks of eating a small amount of food to not eating anything at all. At this point, we don't stress about what goes into her mouth - if she eats we praise her if she doesn't eat, we don't praise her. We know she is getting all of the proper nutrition through her tube so we of course don't stress about her eating at this point. Anyway, back to the BD - everything about it is going wonderful. I couldn't ask for a happier, healthier child - well I take that back - if she would eat orally that would be great. But, little Allie chooses not to eat so we deal with it and now she is getting the best nutrition out of all of us. I have had several people ask questions about BD's and I'm more than happy to help out. I started not that long ago and I'm forever grateful for the friends that helped me get started. Putting Allie on a blenderized diet has been the best decision I made in a long time. She is a totally different child since being on the BD. I would especially like to thank Stephanie for answering all of my "silly" questions and really giving me the push to start making Allie's real food. Steph - please know that I appreciate your help and your continued support - you made the transition from enteral formula to BD possible! 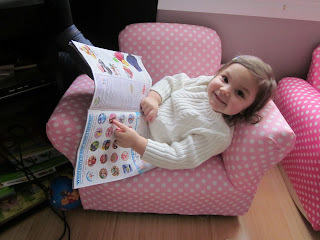 When I started Allie on a BD, I had a ton of questions and I was constantly searching the Internet for answers. I found the best thing was to not stress too much about it or it will consume you. Starting a blenderized diet is a learning process and like everything else - with time you will get the hang of it. Tonight I made two video's in regards to Allie's blenderized diet. One video shows me making one of her blends and the other video shows how we bolus feed her the blends. I apologize the video's are a bit long but I wanted to make sure I included as much information as possible. This first video is how I make Allie's blends. Allie met with her regular Pediatrician this afternoon to start her weight checks. We agreed to having her weight checked every 3 weeks to monitor her progress with her new tube food (blenderized food). 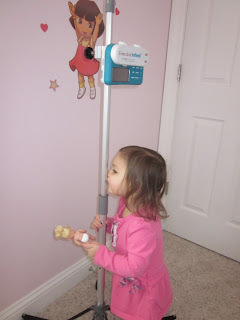 I have been tracking Allie's weight at home so I know she is gaining weight, however our Pediatrician, GI doctor, and Dietician all agreed they would like to closely monitor her so they recommend we bring her in for weight checks. Allie won't mind because she gets a sticker out of the deal. Allie will also start getting regular blood draws to check her complete chem panel. These are the things they will be checking her for regularly. Allie will have her blood work drawn the middle of April and then she will get it drawn again in 3 months. If all of her levels stay stable (being on the blenderized diet), she will probably get her blood work checked every 6 months. So, no matter what the doctors scale reads, I know my little girl is gaining. I will continue to track her weight at home and just to satisfy all of her doctors, I will also bring her in to the clinic every 3 weeks and let her get on the scale in order to earn a sticker. Everyone here is doing great. Chloe is enjoying soccer and wants us to sign her up for summer soccer. Matt is busy with work like usual and I'm busy keeping up with the girls. We leave for our Florida vacation in a week and I'm not even close to being ready. I forget how much packing goes into a 2 week vacation. Not to mention all of Allie's feeding supplies and this year it's even more of a challenge with the blenderized diet. I haven't ironed out yet how we will be making her blends while we travel, I'm still trying to figure out how we are going to offer her food at all the restaurants along the way. For now, we plan to take a small fridge in the van and have "safe" corn & gluten free food for Allie to eat while we stop for breakfast, lunch & dinner. The good thing is she doesn't eat much orally but she always has an opinion as to what food she "thinks" she wants. So, we have to be prepared! If anyone has any traveling tips for food allergies and tube feeding, please send them my way. No matter how much prep work is needed for this trip, there is no doubt a vacation is going to be a wonderful break!!! Chloe does all the hard work around here. 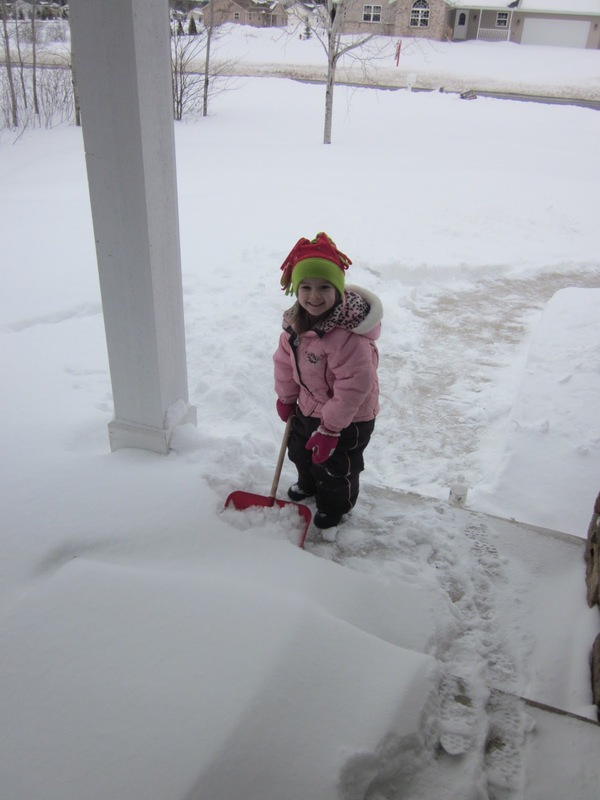 Big girl is shoveling the walk way for me - love her! 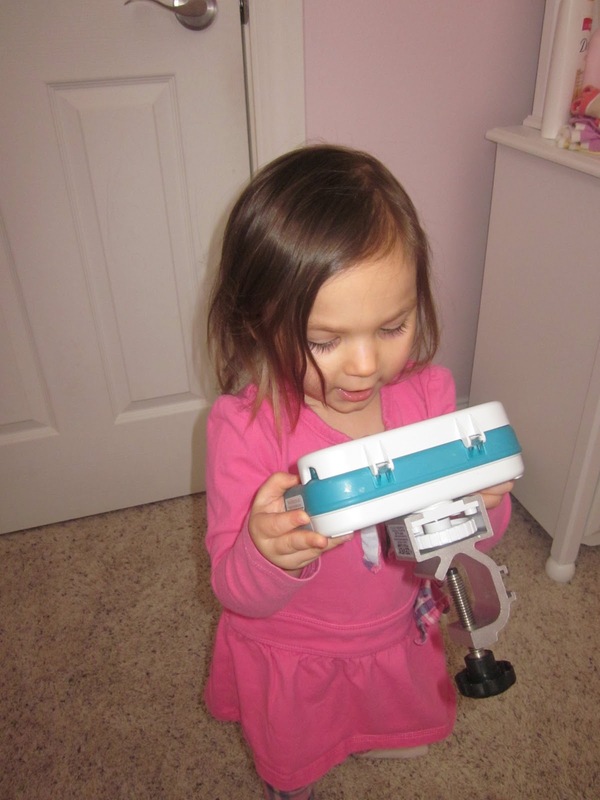 Today we let Allie say "Good-bye" to her feeding pump. Her need for the pump ended a couple weeks ago when we decided to give her a bolus feed or two during the night instead of making her be hooked up to the pump all night. 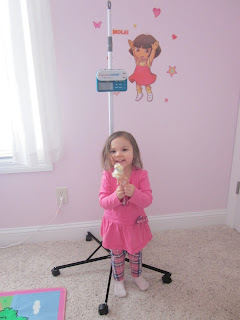 As I mentioned in one of my previous posts, Allie was petrified of being hooked up to the pump and she was not sleeping at all during the night. Since taking her off the pump at night, she has been sleeping great! Of course we are not saying "good-bye" to the pump forever. We will keep the little guy around for a while because we all know to well that if a tube fed child gets sick, they dehydrate very easily. Sometimes when tube fed kids are sick, the easiest way to get water or pedialyte into them is with a continuous slow feed with a pump instead of a bolus feed. In addition, we need to confirm a little longer that Allie is going to tolerate all of her tube bolus feeds 100% before we turn the pump back over to the medical supply company. However, saying "good-bye" to the pump right now means he's leaving Allie's bedroom and taking residents up in the basement. He'll be stored in a nice plastic bag right next to his best friend "the medical pole". If there comes a time in the future when Mr. pump is needed again, we will know where to find him. I have to say, Allie's room looks very nice with no feeding pump in it. This is a sight I didn't think I would see for quite a while but here we are, March 5, 2011 and we are saying good-bye to Mr. pump. Allie was quite thrilled and even kissed her medical pole good-bye. Of course, Chloe had to get in on it too. 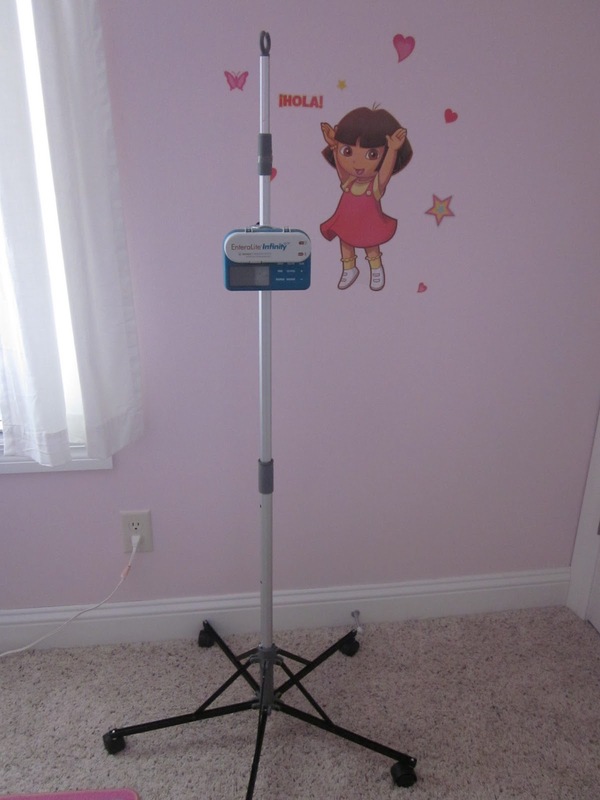 Keep in mind, Allie's had this pump around with her for the past year - it's almost become a permanent fixture in her room or in her backpack. Getting rid of the pump is a big deal for Allie - I know she has secretly hated him all along. I could tell because she always put up a tough fight when it was time to be hooked up to him - I think it was a love hate relationship - lol. 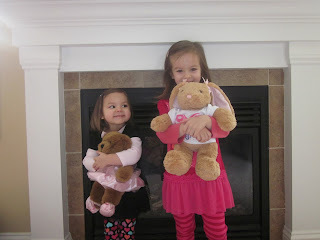 Here are a couple pictures of the girls saying good-bye to Mr. pump and Mr medical pole. Hopefully we won't have to see them again until it's time to return them to our medical supply company. Here is the lonely pump and medical pole that Allie hasn't needed for several weeks. So excited to see him leaving - even Dora in the background is happy! Things in the Berndt house are under control and it's smooth sailing. We have been extremely busy with Allie's doctors appointments along with numerous evaluations for Early Childhood and then her neurological development in general. Even with Allie being extremely shy and not liking guys, especially male doctors, she has participated in every evaluation very well. She loves being evaluated and loves the "one on one" attention she gets. She try's to come across as being completely shy but when the doctor or therapist offers her a sticker, she totally ham's it up and becomes a little sweetie pie. Of course, when she's tired of something she simply says, "all done" or "I don't know answer". There is no giving in either, when she's done she's done!!! We are continuing to keep Allie mostly corn free and gluten free. Of course I am finding hidden corn in a lot of things these days but Allie is doing great with the foods she is getting so we aren't going to change anything up at this point. 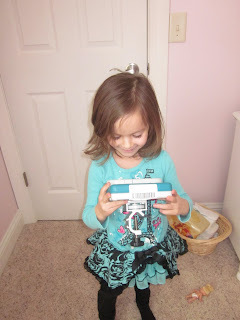 Allie is handling all of her bolus feeds and we are slowly increasing the volume. She is now receiving 5 bolus feeds a day with 5.25 oz of blenderized diet and a 1 oz water flush. She does not gag or vomit or anything. She can jump around right after a feeding and have no vomiting issues at all. Honestly, I never thought life without vomit could be so good. I had become so used to Allie vomiting during each feed that I was numb to it all - including the smell and the mess it made. Now, we have been vomit free for a while and looking back, I give myself and Allie credit for making it through such a tough time. We were both miserable and neither one of us enjoyed tube feeding!!! It's a different story now - of course I wish Allie would eat like a normal 2 year old but for now, what we are doing is working and it's working well. Allie is growing and handling all of her tube feedings. She goes in to start bi-weekly weight checks on Monday - I cannot wait to see how she registers on the doctors scale. This morning I weighed her and she was 25.6 pounds - yup, that's right. A whopping 25.6 pounds - yeah Allie. Here are some more pictures of Chloe at soccer this week - I'm so proud of her! Little Miss Chloe is getting so big! 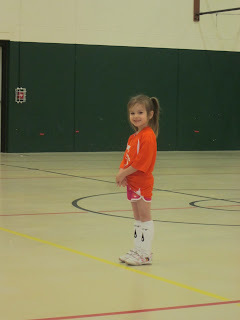 This is how Allie entertains herself while watching sister play soccer. Allie was evaluated by Dr. Mohrland this morning for her full neuro-developmental evaluation. The testing took 1 1/2 hours and she did great. 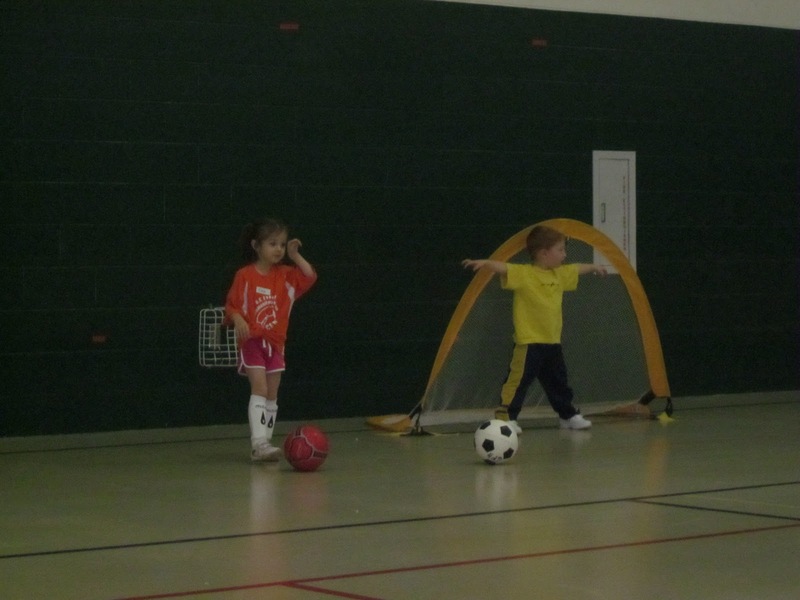 I'm not sure exactly what all area's they tested for but I do know they tested her cognitive development. I had forgotten to fill out my "paperwork" at home so today I will be spending 2 hours and filling out her "Bayley Social-Emotional and Adaptive Behavior Questionnaire". I have to drop it off at his office tomorrow so he can finalize her test results. 2) Allie has a delay in her speech for articulation. He recommends we keep her in speech therapy and she will eventually catch up with her peers. 3) He does not see any other neurological delays with Allie. He said that she is right on target. 4) He ruled out "Auditory Processing Issues" - he said that Allie just has a mind of her own and is choosing to completely ignore us at times. She is understanding everything we tell her she is just choosing to be stubborn and not responding to us. Little stinker!! Once I get my paperwork into the doctor, we will get her full test results in writing. I know these results are preliminary but I am very comfortable with them. I feel that Allie is progressing at a great speed and even though she may seem immature for her age, I think a lot of it has to do with the fact that we baby her more than we did Chloe. 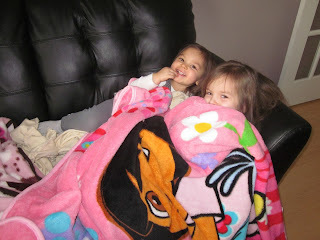 Since Allie is sick a lot more with medical issues, she is nurtured a lot more than an average child. Keep in mind her actual size (small for age) makes her look much younger than she is. 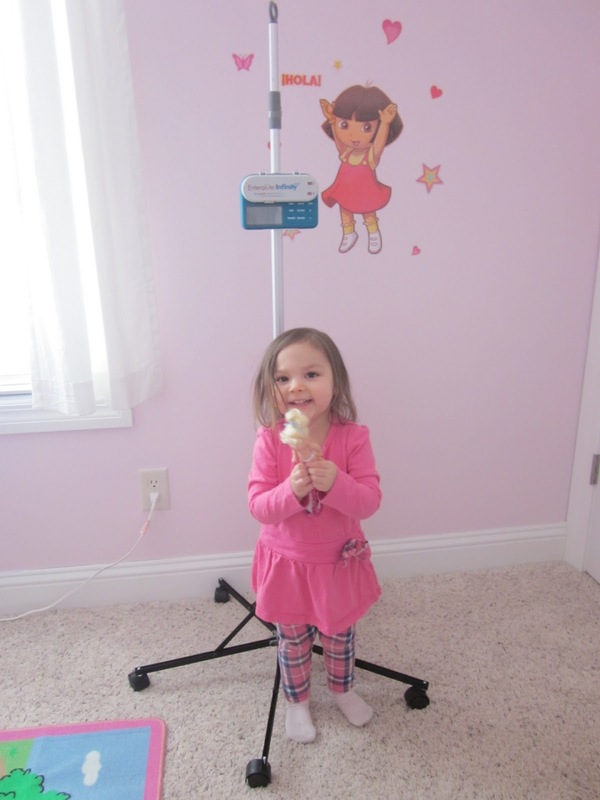 Allie continues to do great with her blenderized diet bolus feeds. We are still vomit free and loving it. Her behavior continues to be manageable. She is gaining weight at a steady pace but has become quite the pooping machine. I'm thinking she's getting a little too much fiber in her diet but I'm having a hard time reducing her fiber in her blends. It's amazing how much "good" nutrients are in whole foods and sometimes you can get too much of a good thing. I'll continue to work on reducing her fiber intake, however Allie doesn't seem to mind being a pooping machine. Now if we could only get her to go in the toilet it would be wonderful!! !